Jesse Peel, a retired psychiatrist and longtime AIDS activist in the Atlanta area. Emory Photo/Video. 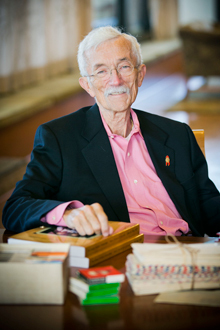 Jesse Peel, a retired psychiatrist and longtime AIDS activist in the Atlanta area, has donated his papers to Emory University's Manuscript, Archives, and Rare Book Library (MARBL). Peel's collection consists of journals, appointment books, subject files, correspondence, photographs and more than 80 reel-to-reel audio tapes he sent to his mother during his tour of duty in Vietnam. "MARBL is committed to expanding our collections that document the history of Atlanta and the South," says Rosemary Magee, director of MARBL. "Dr. Peel's papers demonstrate the power of courageous inquiry and collective action to benefit the lives and health of so many." "The collection is remarkable," says Randy Gue, MARBL's curator of Modern Political and Historical Collections. "It provides great insight into Atlanta's response to the AIDS crisis." Peel says he decided to place his papers at Emory because "I was impressed by MARBL's dedication to preserving Atlanta's history and its desire to include gay and lesbian history. I wanted to be a part of it," he says. Originally from Everetts in eastern North Carolina, Peel graduated from the University of North Carolina at Chapel Hill, where he attended medical school, then completed his residency in psychiatry at the University of Pennsylvania. He spent two years in the Navy, with tours in Vietnam and Okinawa. He lived in San Francisco and Nashville before moving to Atlanta in 1976 — just before the start of the AIDS epidemic. Peel's psychiatry practice in Atlanta served gay men. In the 1980s, a lot of his clients and friends started dying of a new disease that eventually became known as AIDS. "Atlanta had a unique, grassroots response to the AIDS crisis," Gue says. "People responded in the only way they knew how. Jesse said 'I know how to throw parties,' so he threw parties to raise money for these organizations." Peel was one of the founding members of several activist groups, including AID Atlanta and Positive Impact, a mental health program for people with HIV and their friends, family and caregivers. "He served on the board and raised funds for just about every important AIDS service organization in the city," Gue says. Among the most moving pieces of the collection are the numerous appointment books Peel kept over the years. They contain the names of his clients and friends who died of AIDS; funeral programs had been tucked inside the books. "They're a pretty powerful testament when you turn page after page, and you see name after name after name after name," Gue says of the datebooks. "The scope and scale of the crisis hits you in a visual way and a concrete way that's hard to imagine. Just the sheer weight of the number of names as you go through the pages takes on a mass and makes it real in a way that other things don't when you're talking about the AIDS crisis." Peel's collection includes a five-volume set of published journals that incorporates photos and ephemera. Peel spent three years transcribing the handwritten diaries he kept from 1983 through the late 1990s. He stopped writing for several years in the 1990s, but filled in his recollections of those years during his transcription process. He also filled in his high school and college years as well as recent years. The journals started as a travel log from a trip he took with his partner at the time, but then became "an extension of therapy" to include details about family and "dysfunctional relationships" with partners, the emergence of AIDS and the deaths of so many he knew, and his community involvement, he says. Peel says that in re-reading his journals, he could see that "as the stress mounted, as the epidemic progressed, the narration got more intense. When I transcribed them, I chose not to sanitize anything." MARBL is committed to expanding its collection of LGBT material, particularly to document LGBT history, culture, politics and public health in Atlanta, in Georgia and in the South, Gue says. Atlanta was small enough that it could have a community response to the AIDS epidemic, different from New York or San Francisco, which had a variety of organizations spread over a large geographic area. "I'm fascinated with Atlanta's response to the AIDS crisis, because it's really a singular, unique response in this country," Gue says. "We need to get these materials together so we can tell the story." MARBL will have a booth with more information about its LGBT collections at the Atlanta Pride Festival this weekend, Oct. 13 and 14 in Piedmont Park.